The contact between brush and power lines causes your power to blink and generally interferes with your service quality. You report this to us, and we must pay a lineman to fix these problems. During storms, branches located above power lines may fall on them and break the lines, causing an outage and requiring costly repairs. 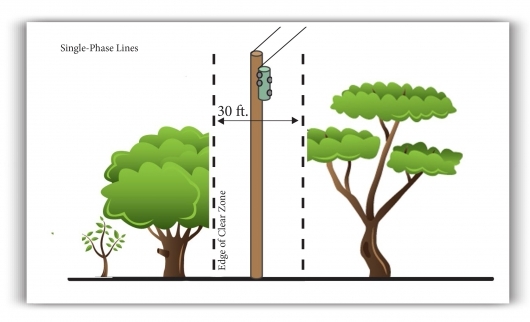 When trees and brush touch power lines, they actually "steal" energy flowing through the lines. The lost energy must be bought from the generation facility by the cooperative and members. The goal of Cookson Hills Right-of-Way Program is to stop the growth before it gets to the lines, and to trim away branches which may fall on the lines. Cookson Hills uses every precaution as it sprays and cuts to destroy the costly growth. Every Spring, new growth brings new problems. Cookson Hills will replace a tree, if the tree had to be removed because it did not fall within our guidelines for safety and maintenance. Replacement will be based on availbility at that particular time. If you wish to have a larger tree, you may be required to pay the difference. 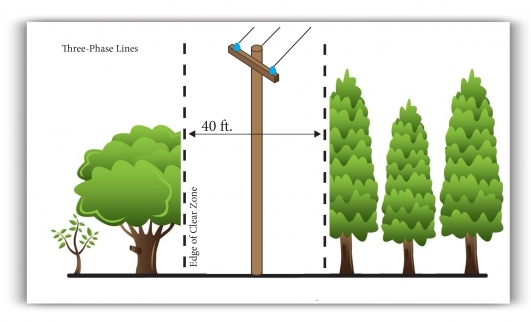 Trees should not be planted within 50 feet of the power lines, 25 feet on each side. Mark out the planting area at least five times the tree's rootball diameter. Loosen and mix the soil in the area to a depth of about 12 inches, no deeper. Set the tree upright and shovel the original soil back around the rootball. Pack the soil with shovel handle and water the area thoroughly. Add soil to any sunken area. Cover with 2-3 inches of mulch to help retain water. Remember, if you are planting trees, look up. Don't plant them directly under a power line. Also, if you notice trees or brush which are touching Cookson Hills power lines, or are within ten feet of touching a line, please call 1-800-328-2368 or e-mail us at services@cooksonhills.com.